Row after row of blackened wood barrels are piled 30 feet high in a dim warehouse on Avery Island in southern Louisiana. Harold “Took” Osborn leads me through the endless stacks, in a setting reminiscent of the final scene of Raiders of the Lost Ark. The recycled bourbon casks are filled with Tabasco mash, laid to rest for three years until they’re ready to become the signature condiment. Some of the barrels are bubbling with the gaseous byproducts of the aging process. The air is thick with the smell of pepper, vinegar, and salt. We are both coughing. “Deer conglomerate here when the mosquitos get really bad,” Osborn tells me, explaining that that the vapors are powerful enough to drive away the bugs. Osborn is the executive Vice President of McIlhenny, the company behind Tabasco, and the great-great grandson of Edmund McIlhenny, who first concocted the popular pepper sauce on Avery Island in the 1860s. He started working for Tabasco as a kid in the 1970s (unofficially, and discreetly paid). 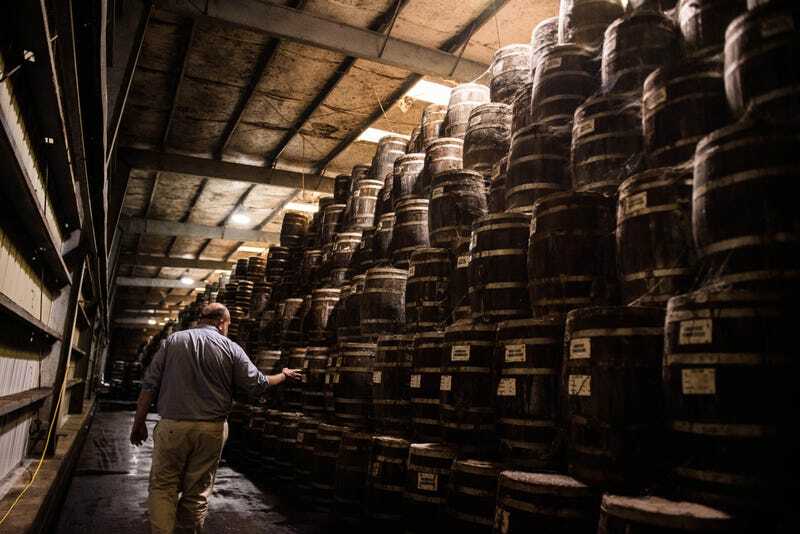 Although they now produce more Tabasco sauce in one day than Edmund McIlhenny made in his entire life, the process has transitioned to mass production with few alterations. “It’s remarkable how little has changed,” he says. When we walk out of the warehouse into the sun and breathable air, though, we come across one of the few conspicuous changes Avery Island has seen over the past century: a 17-foot levee that encircles 38 acres of the Tabasco operation. The company was forced to make this $5 million investment in 2005 after Hurricane Rita nearly flooded the facility. Even though it’s only 152 feet above sea level at its peak, Avery Island is one the highest points in the Gulf Coast. A two hour drive west of New Orleans, it sits atop an enormous salt dome that bulges from the earth, elevating the land above the swamps and bayous that surround it. A generation ago, it was unthinkable that this natural fortress could be overcome by water. But Hurricane Rita’s threatening surges were a symptom of an immense shift in the Gulf Coast, the result of decades of harsh land use practices and climate change. “The waters are rising,” Osborn says. Now, the McIlhennys are fighting to save the island to which their family history and business are inextricably linked. This $5 million, 17 foot tall levee was constructed after Hurricane Rita nearly flooded the Tabasco factories in 2005. Louisiana is losing land at a rate of one football field every 100 minutes. The marshes that provide a buffer between the coast and the temperamental Gulf of Mexico are falling apart, exposing the cities and towns of Southern Louisiana to the direct blow of storm surges. “If you don’t have marsh and natural systems out ahead to knock down that surge, you’re just a sitting duck,” says Randy Moertle, a longtime biologist and the land manager of Avery Island. The Mississippi River once reinforced the swamps and marshes with its excess freshwater and the tons of sediment it carried. But this process was inhibited when levees were constructed to contain the river and prevent flooding, a project that ramped up significantly in the mid-19th century. Today, Louisiana’s Flood Protection Authority estimates there are roughly 1,000 miles of flood control structures along the entire length of the river and its tributaries. Industry has also taken its toll. Since the early 20th century, tens of thousands of miles of wetlands have been dredged to build canals and lay oil and gas pipelines. The dredging changed the delicate hydrology of the wetlands and carved paths for saltwater intrusion, which kills the freshwater vegetation holding the land together. Some of the canals have naturally tripled in width since they were built, eroding their banks over time. Meanwhile, intensifying hurricanes and sea level rise, driven by climate change, are aggravating all these problems. Over a cup of Tabasco ice cream smothered in blueberry Tabasco sauce (surprisingly good), Osborn tells me he’s optimistic that they’ll remain on the island, even as a flurry of recent media attention has framed their future as uncertain. “We fight hard. We’ve been here 150 years. And I believe that someone will be here to celebrate the 300th anniversary,” he said. Osborn, who holds a master’s degree in environmental science from the University of Oxford, has led an effort to protect the island since the early 1990s. Insisting that the solution doesn’t lie in engineered protection alone, he instead uses a holistic approach that treats the protection of ecosystems, wildlife, and culture as parallel goals. His ultimate goal is to protect and rebuild the marshes that act as a cushion between his island and storm surges. To that end, the company has planted cord grass to plug up old canals and fortify the wetlands. They’ve invested in water control structures to regulate the wetlands’ delicate circulatory system. They hunt the invasive feral hogs that erode the swamps. “That’s just the stuff that worked,” Osborn says. “I could give you an even longer list of things that didn’t work.” The autonomy of being part of a family-owned company allows Osborn to experiment with any idea that’s affordable and seems worth trying. The McIlhenny family built these terraces, known as Bird City, in 1895 to help Snowy Egrets rebound from near extinction. The RCA now manages over half a million acres of land, and Moertle calls the effort “off the charts successful.” They’ve been able to secure tens of millions of dollars for coastal projects including marsh creation, bank stabilization, and hydrologic management programs. And Osborn and Moertle say they’ve been more effective than most of the coast at keeping oil and gas companies in check, compelling them to use more sustainable practices and help mend the damage caused by decades of operations. Eighty five percent of Louisiana’s coast is privately owned, and Osborn sees this type of local, private effort as a key ingredient for maintaining a healthy coast. But whether this model can be recreated en masse by landowners along the entire Louisiana coastline is unclear. Osborn hops behind the counter at the Avery Island Tabasco shop to show off his favorite products. Whether other Louisiana companies will follow Tabasco’s model of corporate responsibility, or whether Tabasco’s environmentalism will stand out as a singular case of a wealthy, conservation-minded family with strong geographic roots, remains to be seen. But Louisiana doesn’t have much time to wait and see. Based in New Orleans, Michael Isaac Stein writes about criminal justice and the environment in the Gulf.